The MSRB’s retrospective rule review, an ongoing effort to review rules and related interpretive guidance for brokers, dealers, municipal securities dealers and municipal advisors, got a boost last week with the release of priorities for the year. 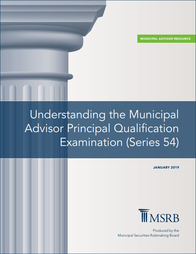 For 2019, the MSRB has prioritized a retrospective review of MSRB Rule G-23, on activities of financial advisors and MSRB Rule G-34, on CUSIP numbers, new issue, and market information requirements. In addition, the Board has approved a filing with the U.S. Securities and Exchange Commission (SEC) to eliminate MSRB Rule G-29, which requires dealers to keep a copy of all MSRB rules in all offices that conduct municipal securities activities. MSRB Rule G-29 has become obsolete due to public accessibility of the rules on the MSRB’s website. The MSRB also will conduct a technical review of the entire MSRB rulebook to, among other things, delete transitional provisions that are no longer in operation and update outdated references. Read more about the MSRB’s retrospective rule review. Hear a brief overview of the retrospective rule review from MSRB Chief Regulatory Officer Lanny Schwartz. In December 2018, the MSRB established a formal Academic Program as part of its mission to support academic and other researchers. The program includes a new Visiting Scholar position and the ongoing provision of multiple municipal market data sets to universities and other institutions looking to research the municipal securities market. To expand municipal securities market research, the MSRB seeks a candidate to join the organization as a Visiting Scholar. The scholar will conduct in-depth analyses on municipal market data collected by the MSRB and from other sources. Learn more about the Visiting Scholar position. For several years, the MSRB has provided the academic and research community access to several data products from the MSRB, including historical sets of trade data, primary market and continuing disclosures, and information related to variable rate securities. Learn about data sets available from the MSRB and how to make data requests. Access to municipal market trading data is also available through an agreement with Wharton Research Data Services (WRDS), a service of the Wharton School of the University of Pennsylvania. In 2019, members of the MSRB Board of Directors will participate in numerous stakeholder events around the country in an MSRB outreach effort unprecedented in its scope. Upcoming events include outreach programs, conferences, town halls and roundtables that will provide opportunities for Board members and MSRB staff to hear directly from municipal market participants. Board Chair Gary Hall and Board members Richard Ellis and Manju Ganeriwala will be participating in the 2019 National Association of State Treasurers Legislative Conference in Washington, DC, on February 10–12, 2019. During the week of February 18, 2019, Board members will be meeting with dealer and municipal advisor firms in Chicago. On February 21, 2019, Chair Hall and Board member Dan Kiley will participate in the Midwest Compliance Roundtable with the St. Louis Bond Club at Commerce Bank in St. Louis, MO. Register for MSRB events. This year, the Board is also taking the opportunity at several of its quarterly meetings to meet with groups representing entities regulated by the MSRB—dealers and municipal advisors—and those whose mission it is for the MSRB to protect—investors, municipal entities and obligated persons. Listen to Chair Hall discuss how the MSRB is prioritizing stakeholder engagement in 2019. See a list of current Board Members and their bios. In 2019 the Board will elect three public representatives and two regulated representatives. Applications are available on the MSRB Board of Directors Application portal and will be accepted until February 15, 2019. The Board consists of 11 members who are representatives of the public, including investors, municipal entities and other individuals not regulated by the MSRB; and ten members from firms that are regulated by the MSRB, including representatives of broker-dealers, bank dealers and municipal advisors. The Board is divided into four classes whose members serve staggered, four-year terms beginning October 1 in the year elected. Hear what Kemp Lewis, Senior Managing Director at Raymond James and MSRB Board bank representative, finds fulfilling about his role. Questions regarding the application and selection process should be directed to Mallory Bucher, Manager, Corporate Governance and Board Administration, at 202-838-1349 or mbucher@msrb.org. 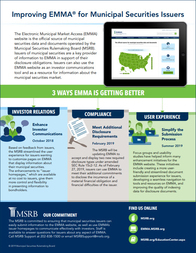 This document outlines the MSRB's three-part plan to improve user experience, investor relations and disclosure submission requirements for municipal securities issuers using EMMA. This document outlines new disclosure obligations for state and local governments under amended SEC Rule 15c2-12. The effective date for SEC Rule 15c2-12 amendments is February 27, 2019. 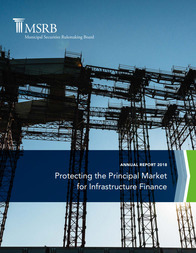 The MSRB's annual report, Protecting the Principal Market for Infrastructure Finance, includes audited financial statements. 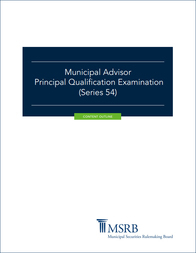 This guide is intended to assist individuals preparing to take the Municipal Advisor Principal Qualification Examination (Series 54). The timeline shows key dates in 2019 for the Series 54 pilot and exam. This content outline details key concepts and rules to be tested on the examination and the percentage of the examination devoted to each topic area. 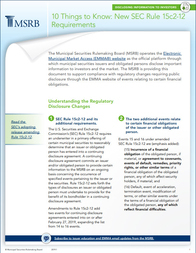 Visit the Rules and Guidance page of msrb.org to stay up-to-date with the latest requests for comment, proposed rule changes, rule approval notices and market advisories. Visit the online Compliance Center for resources and information to help regulated entities understand and comply with MSRB rules. Read the MSRB’s latest press releases on msrb.org.